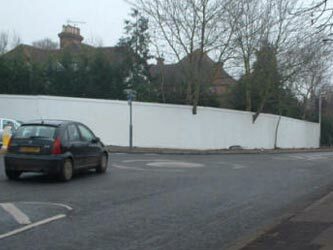 We can supply a complete site hoarding service including delivery of materials and erection of hoarding also the supply and fitting of access gates to your specifications. Worksites should be completely fenced to prevent public access. The standard height of hoarding should be 2.4m plywood faced timber framed boundary hoarding for normal security and noise limitations. A higher standard may be required in some circumstances. Hoardings should not end in sharp edges for reasons off pedestrian safety.